Reader runs ‘no plastics’ campaign for three years, encourages people to save the planet. Plastics are being used at such a large scale that most of us do not know what was used instead of it, before its discovery. Since its invention, we have produced about 8.3 billion metric tons of plastic and by 1970, its production surpassed that of steel. This sudden ubiquity is because of the greed of manufacturers and the ignorance of consumers. However, it doesn’t stop there. Almost half the plastics produced such as straws that are hardly used for a minute are meant to be thrown away after just a single use. The problem in all this is actually the advantage plastic has over other materials, which is its durability. They are so durable that they well exceed the intended time – by about a 1000 years. Thus, practically every piece of plastic that was ever created still exists in some shape or form. A great portion of plastics is tossed into the largest natural biome – the ocean. Around 8 million tons are pushed into the oceans annually and it is predicted that by 2050 that trash in these waters will outweigh fish. Inevitably smaller plastic particles are ingested by fish and due to bio magnification, a process by which harmful substances are concentrated in an organism as larger animals continue to eat smaller animals, and become a part of the food chain. This process moves toxins up the food chain to larger organisms and is of particular concern with regards to concentrating dangerous toxins in larger species, which badly affects the organism. Thus it is evident that plastic pollution is a serious issue that hurts our planet and costs the lives of millions of animals on land and at sea every year. Due to irresponsible usage plastic has become one of the most serious challenges in the ecological sphere. In a message, UN Secretary-General António Guterres urged all people to reject single-use plastic items, and warned that growing levels of plastic waste were becoming unmanageable. At this point, action seems absolutely necessary if we intend to stay alive. With all that said, we do understand that plastics have become an integral part of everyday life so removing it completely is complicated and will take time. However, we must start somewhere. Considering these facts, my friends and I took it as our responsibility to share this message to as many people as possible since awareness is the first step to reaching a goal. 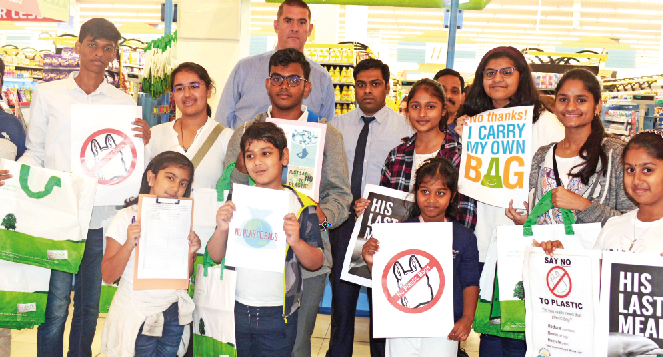 Accordingly, we set out to organise a ‘no plastics’ campaign in public places, such as hypermarkets, to advance our cause of protecting Earth and to inspire change. Every year, from the past three years, we have been carrying out the campaign. Like each time, we spoke to various people and explained effects that plastic had on our environment this year too. We requested them to sign a pledge to reduce the amount of plastic - especially single use plastics they used in their day-to-day life. We handed them a recyclable bag that would help them start their journey in adapting a sustainable lifestyle. We hope that this campaign encourages Gulf News readers as well to think about the difference we can all make to help tackle this global issue. However, we believe that our campaign is only a small step, and we still have a long way to go. Our dream is to live in a world where the majority of people live an eco-friendly lifestyle and exist in harmony with Nature and we aim to achieve this by inspiring people to work towards protecting, preserving and conserving the environment. Let’s stand against plastic pollution, together. — The reader is a student based in Dubai.